Part way through making applesauce, I decided to make some Apple Jelly ... then I thought I'd add some garlic, fresh rosemary and course-ground black pepper to a few jars to use as a basting sauce on grilled/roasted chicken or pork. It tastes amazing! Lots of apple and garlic flavor with just a hint of the rosemary and pepper. Perfect. * How much water to use is not an exact science, since some varieties of apples are much more juicy, and even the same variety varies depending upon the weather. Honey Crisp, Delicious and Gala, for example, tend to be juicy/ watery; while most baking apples, like Rome, tend to be drier and require more water. Add water to a large stock pot. Put quartered apples in stock pot; cover and bring to a boil over a high/med-high heat. Once it's really boiling, turn heat down to medium and cook until apples are very soft and begin to break up and become applesauce. Stir often to prevent sticking. Once apples are cooked, remove stock pot from heat and strain apples through a tight mesh colander over a large non-reactive bowl (stainless steel or glass). Allow to drain until you have about 6 cups apple juice (I strained mine for about 30 minutes, pushing the apple pulp with the back of a spoon once in awhile to yield more juice). Add apple juice to stock pot and stir in one package Sure-Jell. Bring to a hard boil over high heat, stirring to prevent sticking. Once a rolling boil is reached, add sugar all at once and return to a rolling boil. Jelly will splatter as it's boiling so use a long handled spoon. Boil hard for 1 minute. Remove from heat and ladle into canning jars. At this point you have plain apple jelly. 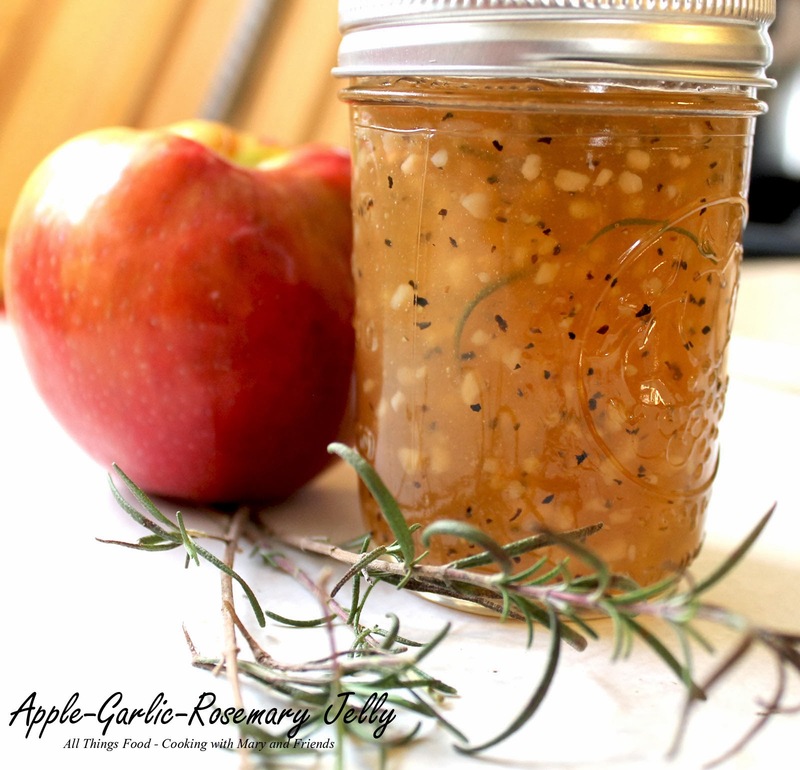 To make Apple-Garlic-Rosemary Jelly (8 oz. jelly jar size) add 1 heaping tsp. minced garlic (I used garlic in a jar), fresh rosemary leaves and 1/4-1/2 tsp. course-ground black pepper; ladle apple jelly over top of mixture, cover jars with seals and rings. Process jars (8 oz. or pints) in a boiling water bath 5 minutes. Remove jars from canner and allow to cool 24 hours. Store in pantry. After the jars have cooled for a bit, and the lids are sealed (button in center of lid is fully depressed and can't be moved), gently shake the jelly with the garlic, rosemary and pepper to evenly distribute in the jelly. Do this from time to time as the jelly is setting up.